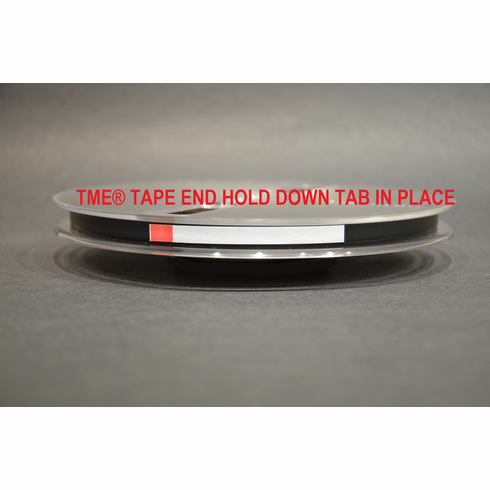 TME® (Tape Media Engineering) has now released, and is available for shipment, their AC1HTABR Open Reel Media Tape Hold Down Tabs. Made in England, these tabs are custom made with a brand new die and feature a red stripe on one end which you can position to show if the tape is tail out or head out. With these tabs you no longer have to cut hold down tape, and the special silicone adhesive will not contaminate your tape, especially considering some *stuff* we've seen for sale for this purpose! The tabs simply peel off the clear plastic backer sheet and stick into position. Each end of the tab has NO adhesive (for approximately .2" on the red striped end and .7" on the white end) making application a snap, and also removal from the tape a snap. TME® did a lot of research on adhesives and substrates for this new product, and we're sure you'll be happy with these new tabs! Each tab is precut to .250" wide and 2.9" long, and comes 32 on each sheet. This version ships 4 sheets for a total of 64 tabs. Other higher sheet count versions are available. Comes as four sheets of 32 tabs each factory sealed to ensure freshness.